In the wake of our upcoming monthly content package, there will also be a couple of changes to the Nomad Invasion/Khan's Revenge events. We will introduce an additional challenge to the Nomad Invasion/Khan's Revenge events which will be mainly focused on the reward pool. This new challenge will start with the 46th reward and go up to the final 72nd activity reward. So you can get 27 new rewards. The points for the former 46 reward ranks will also be increased by a moderate amount, but they are still at an achievable level. Overall the fight for the best rewards will get harder in this challenge, but the newly implemented rewards will be fitting accordingly to that! There will be new rewards for the alliance pool, as a new item set in our individual activity pool. We furthermore overhauled the current alliance activity rewards and points. The item set "Armor of the Eastern Raiders" which was used to be in the Top-X reward pool will be purchasable via the khan tablet trader in the future, while the khan medal shop will provide players with one new construction item. The 3 items from the new equipment set not mentioned in the activity pool above will rotate as the 27th reward in the first set of activity rewards. You can get this Set in the Nomad invasion! As usual you can discuss the Update in the discussion thread HERE! As promised, here is our second teaser for our upcoming April update. Check out next months content package! Winter is gone and Spring has finally come. This month will start the season of renewal and regrowth in our Great Empire. But with the blooming of fresh ressources, an epic fight for them is sure to follow! 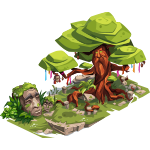 So make way for the Spring Nights Festival, were nature itself will take action and bring forth the likes of Dryads and Nymphs to aid you in your battles! Treasures are also to be won, for every warrior who fights on nature's side shall be granted access to it's dearest possesions. 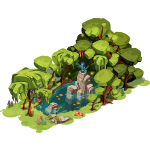 So align yourself with nature and fight for a flourishing Empire in our Spring Nights Festival! This longterm point event will run from March 27th until the 24th of April. Artifacts of the new bloom: You can get this Set in the next Long term point event in April! Armor of the woodland nymphs: You can win this Set in the Long term point event in May! 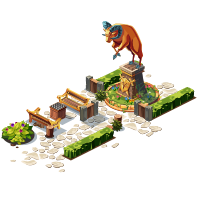 You can win a new decoration in the next royal quest campaign, it is called The Ram (PO 320) which symbolizes another Zodiac sign. In our next update we are going to raise the cap for certain packages which you can purchase via the armorer and equipment trader up to a stock of 10 items/units. An example for this would be the Power of the elements General Set (used to be not rebuyable, but now has a stock of 1 and therefore is rebuyable with every iteration) at the equipment trader and the Veteran flame bearer unit (used to have a stock of 1, now has a stock of 5) at the armorer. You will be able to purchase the easter appearance item for castellans at the equipment trader in your castles.